This article needs attention from an expert on the subject. The specific problem is: this article is very technical and at the same time lacks references. After merging Brent Index article here, it also needs checking for potential repetitions. Brent Crude is a major trading classification of sweet light crude oil that serves as a benchmark price for purchases of oil worldwide. This grade is described as light because of its relatively low density, and sweet because of its low sulphur content. Brent Crude is extracted from the North Sea and comprises Brent Blend, Forties Blend, Oseberg and Ekofisk crudes (also known as the BFOE Quotation). The Brent Crude oil marker is also known as Brent Blend, London Brent and Brent petroleum. Brent is the leading global price benchmark for Atlantic basin crude oils. It is used to price two thirds of the world's internationally traded crude oil supplies. Originally Brent Crude was produced from the Brent oilfield. The name "Brent" comes from the naming policy of Shell UK Exploration and Production, operating on behalf of ExxonMobil and Royal Dutch Shell, which originally named all of its fields after birds (in this case the brent goose). But it is also a backronym or mnemonic for the formation layers of the oil field: Broom, Rannoch, Etive, Ness and Tarbert. Petroleum production from Europe, Africa, and the Middle East flowing West tends to be priced relative to this oil, i.e. it forms a benchmark. The other well-known classifications (also called references or benchmarks) are the OPEC Reference Basket, Dubai Crude, Oman Crude, Shanghai Crude, Urals oil and West Texas Intermediate (WTI). Brent blend is a light crude oil (LCO), though not as light as West Texas Intermediate (WTI). It contains approximately 0.37% of sulphur, classifying it as sweet crude, yet not as sweet as WTI. Brent is suitable for production of petrol and middle distillates. It is typically refined in Northwest Europe. Brent Crude has an API gravity of approximately 38.06 which is equivalent to a specific gravity of 0.835. The ICE Futures Europe symbol for Brent crude futures is B. It was originally traded on the open outcry International Petroleum Exchange in London, but since 2005 has been traded on the electronic Intercontinental Exchange, known as ICE. One contract equals 1,000 barrels (159 m3). Contracts are quoted in U.S. dollars. Each tick lost or gained equals $10. Historically price differences between Brent and other index crudes have been based on physical differences in crude oil specifications and short-term variations in supply and demand. 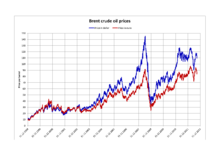 Prior to September 2010, there existed a typical price difference per barrel of between ±3 USD/bbl compared to WTI and OPEC Basket; however, since the autumn of 2010 Brent has been priced much higher than WTI, reaching a difference of more than $11 a barrel by the end of February 2011 (WTI: 104 USD/bbl, LCO: 116 USD/bbl). In February 2011 the divergence reached $16 during a supply glut, record stockpiles, at Cushing, Oklahoma before peaking at above $23 in August 2012. It has since (September 2012) decreased significantly to around $18 after refinery maintenance settled down and supply issues eased slightly. Many reasons have been given for this widening divergence ranging from a speculative change away from WTI trading (although not supported by trading volumes), dollar currency movements, regional demand variations, and even politics. The depletion of the North Sea oil fields is one explanation for the divergence in forward prices. The US Energy Information Administration attributes the price spread between WTI and Brent to an oversupply of crude oil in the interior of North America (WTI price is set at Cushing, Oklahoma) caused by rapidly increasing oil production from Canadian oil sands and tight oil formations such as the Bakken Formation, Niobrara Formation, and Eagle Ford Formation. Oil production in the interior of North America has exceeded the capacity of pipelines to carry it to markets on the Gulf Coast and east coast of North America; as a result, the oil price on the US and Canadian east coast and parts of the US Gulf Coast since 2011 has been set by the price of Brent Crude, while markets in the interior still follow the WTI price. Much US and Canadian crude oil from the interior is now shipped to the coast by railroad, which is much more expensive than pipeline. In addition to the Intercontinental Exchange, Brent crude financial futures are also traded on the NYMEX, with the symbol BZ, and have expiry dates in all 12 months of the year. The Brent Index is the cash settlement price for the Intercontinental Exchange (ICE) Brent Future based on ICE Futures Brent index at expiry. The index represents the average price of trading in the 25-day Brent Blend, Forties, Oseberg, Ekofisk (BFOE) market in the relevant delivery month as reported and confirmed by the industry media. Only published cargo size (600,000 barrels (95,000 m3)) trades and assessments are taken into consideration. A weighted average of first month cargo trades in the 25-day BFOE market. A weighted average of second month cargo trades in the 25-day BFOE market plus or minus a straight average of the spread trades between the first and second months. A straight average of designated assessments published in media reports. ^ "UK brent, crude oil, brent crude,". One Financial Markets/CB Financial Services Ltd. 2012. Retrieved 25 March 2012. ^ "ベーシックな支払い方法について". www.investing-for-beginner.org. Archived from the original on 2012-12-25. Retrieved 23 March 2018. ^ "Shell's floating monster spill • Friends of the Earth". foe.org. 24 December 2011. Retrieved 23 March 2018. ^ Andrew Inkpen, Michael H. Moffet. The Global Oil &Gas Industry. PennWell Corporation, Oklahoma, 2011. p. 372. ISBN 978-1-59370-239-7. ^ ICE Product Guide: Brent Crude Futures. Theice.com. Retrieved on 2013-11-26. ^ US Energy Information Administration, Short-Term Energy Outlook Supplement: Brent Crude Oil Spot Price Forecast, 10 July 2010. This page was last edited on 21 January 2019, at 22:15 (UTC).